The Kennedy Center Fellowship in Arts Management Program (FAM), in partnership with the Arts Management Program at American University, has announced that it will offer two new fellowships to AU arts management MA students. Fellows will work 20 hours a week during the academic year at the Kennedy Center and receive a $15,000 stipend and six credits of tuition remission. The goal of the fellowships, according to the Kennedy Center, is to train the next generation of arts managers, and to foster diversity and equity in arts leadership. For AU arts management students, it is a priceless opportunity to receive intensive professional training and exposure to real-world arts management leaders in a world-class performing arts institution. Fellows will receive intensive training in arts management, strategic planning, fundraising, finance, artistic planning, and marketing. They will have exposure to executive leadership and have the opportunity to get involved in special projects of the their personal interest and benefit to the Kennedy Center. They will participate in collaborative work opportunities across the organization, and receive ongoing personalized mentoring from a senior level staff advisor. Academic advisors will support the Fellows as they pursue their organizational and professional objectives. Full-time incoming or rising second year MA students in the Arts Management Program are eligible to apply through a competitive process. MA candidates receive a scholarship for a designated number of academic credits and a stipend. From American University, FAM participants receive tuition credits described above, benefit from joint learning with the AU external Fellows’ cohort, and receive ongoing advising from the designated AU faculty member. Fellows profit from the opportunity to mesh classroom and fellowship learning. 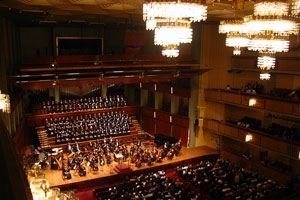 The John F. Kennedy Center for the Performing Arts is a world-class international performing arts organization and our nation’s cultural center. Diversity is a critical component of its mission, vision, and values. Its staff exhibits a wide variety of perspectives and experiences, which enable them to foster and strengthen an environment of diversity and inclusion.